The Climbing/Caving Equipment section contains very specialised equipment, which when in use, can be very critical for the person dangling in a harness on a rope 300′ above (or below!) the ground. For this reason, this equipment is only lent to people experienced in the use and care of it. Rope lengths are given to the nearest 5m, thus should only be taken as a guideline. 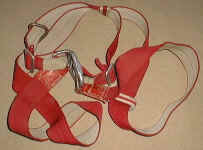 QQ0 Rope loops for climbing. For climbing and caving uses only.